First there's wedded bliss, and then there's the Honeymoon holiday! Honeymoons are a time to celebrate love and are also the symbolic beginning to the start of a marriage adventure. So, what will the beginning of your adventure look like? 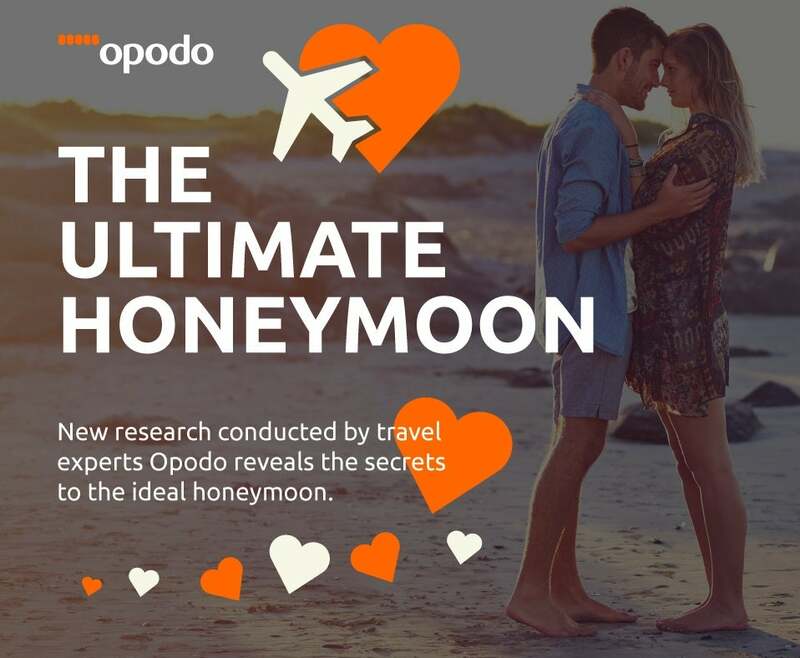 From exotic destinations, to island escapes, big city wanderings and local retreats, Opodo has your Honeymoon dream destination covered. Read on for some Honeymoon tips, top destination picks and amazing Holiday package deals! What would be your dream honeymoon? We surveyed almost 2000 people to identify where the British like to go after tying the knot. The data observed that the majority of British newlyweds are willing to travel an average 11 hours in pursuit of their perfect honeymoon destination and like to spend an average 12 days with their loved one once they get there. In addition, according to our findings, newly married couples should be looking at saving £2,125 in order to be able to afford their ideal honeymoon! The majority of British couples lust after iconic beach locations, with the beautiful Maldives featuring the top destination of choice, followed closely by Mauritius and Aruba. It comes as no surprise then, that going to the beach on their honeymoon comprises British newlyweds’ number one honeymoon activity of choice. Featuring the second most popular honeymoon activity amongst the British is sightseeing. Extreme activities or adventures, perfect for adrenaline junkies, also appeared high up on the list. One in five (21%) of the survey participants expressed that they would like to try skydiving, whilst 19% would opt for the unmissable thrill of shark cage diving. However, what is really the secret of a perfect honeymoon? For 75% of the British survey participants, the secret of a perfect honeymoon involves taking a trip featuring the right balance of romance, relaxation and adventure. Don't wait until the last minute - Yes, your wedding day is important, but so is your Honeymoon holiday. Plan your trip in advance and save money on your flights and holiday packages by booking ahead of time. Decide together the perfect Honeymoon destination - Will it be a relaxing tropical oasis or an adventurous escape through a safari? Honeymoons are something both partners should enjoy, so deciding on what type of scenery to see or the type of activities to do will help make it an amazing experience. Set a budget - With so many incredible destinations to see, it can be easy to over spend. Keep a realistic budget and try to stick to it. Researching the best months to Honeymoon, and searching through package deals are a great option. Luckily, Opodo offers you some great Honeymoon package deals below! Balance = Travel enjoyment - Couples are likely to spend at least a few days on Honeymoon. Keep the trip exciting and balanced with a variety list of things to do including walking through the city center, taking an adventurous trek or relaxing at the hotel's spa. Enjoy the moment - And experience an unforgettable Honeymoon holiday! Could it get anymore exotic than a romantic escape to the South Pacific? Filled with pristine beach and breathtaking sights, this island is the perfect destination for a bit of seclusion, relaxation and fun in the sun. Zen is the next level of relaxation and in Bali, you're destined to experience it. Also a destination with gorgeous landscapes, here you can also delve into the adventurous side with great treking and other activities. The cultural aspect also makes this destination a great Honeymoon experience. History and incredible views are what this destination are all about. Sitting on a cliff and overlooking the Aegean sea, this spot is great for the more active couple who desires great hiking with a view. And at a short hop from the United Kingdom, its a more affordable option without sacrificing any of the key ingredients of a memorable Honeymoon. For a luxurious city escape with great night life, look no further than Dubai. This Honeymoon will surely be a 5-star experience where couples can have what they desire and be pampered by amazing spa services at some of the most luxe resorts. If a trip over seas is the Honeymoon dream, New York is a great destination. Filled with unparralleled city buzz, amazing cultural events at every turn and highly rated cuisine, this city will surely win your hearts and make the Honeymoon unforgettable. Nature lovers will also enjoy this city with it's iconic Central Park nestled in the city center. With miles of coastline and pristine beaches, each unique from the other, Faro is a wonderful destination for a sunny Honeymoon. Culture enthusiasts will also fall in love with the city's history and architecure. For couples looking for a quiet getaway with romance, delicious seafood cuisine and a great selection of port wine, look no further than Algarve's capital city, Faro. Sunny and exotic locations always make for a popular Honeymoon and Antigua is no different. Enjoy a resort lifestyle and escape to this beachy destination in the Caribbean. Some of the area's must do activities include scuba diving in one of the reefs, hiking, or taking a romantic sunset cruise. Few things are as romantic than travelling around a city through canals and on an antique Gondola. Venice, adorned with mosaics, exquisite architecture like St. Mark's Basilica and delicious fare is a city destined to remind couples of the romanticism they felt on their wedding day. Rated a 5/5 for romance, this iconic destination is a wonderful Honeymoon escape. A quaint destination for couples who enjoy historic landscapes, strolling through city streets and enjoying a good pint, Dublin is a sweet escape close to home. From brewery tours to short day trips to some of the most lush countrysides and nights nestled in B&Bs by fireside, this city is a nice way to enjoy a Honeymoon holiday.